Why make an ordinary grilled cheese when high-quality mozzarella and muenster cheeses melt to gooey perfection creating a to-die-for sandwich? 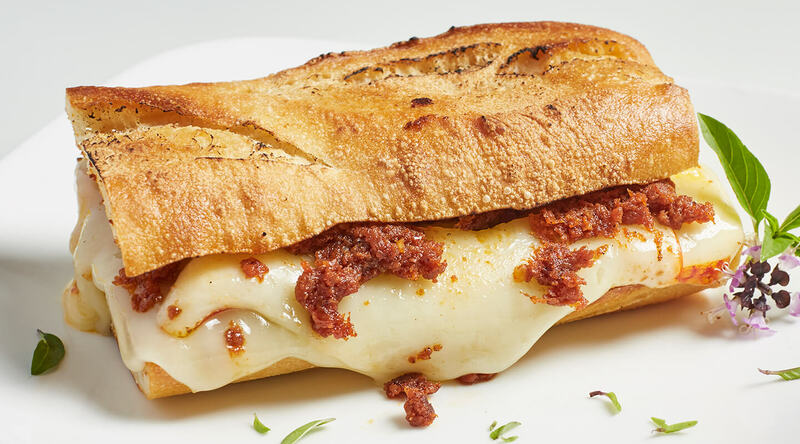 The nduja adds savory pork flavor with spicy heat. Five ingredients. Simply extraordinary! Look for the Proudly Wisconsin Badge when shopping for cheese. Any brand of Wisconsin Mozzarella or Muenster can be used in this recipe. Spread each bread slice with nduja. Layer two bread slices with mozzarella and muenster. Top with remaining bread slices, nudja side down. Spread the outsides of sandwiches with butter. Toast one sandwich, covered, in a warm, large skillet over medium-low heat for 2-3 minutes or until side is golden brown. Flip sandwich; cook, uncovered, 2-4 minutes longer or until bread is golden brown and cheeses are melted. Repeat with remaining sandwich. Nduja is a cured and spicy, spreadable pork salumi from Italy. It’s traditionally made with pork, spices and a balance of sweet and spicy chili peppers. Weyauwega Star Dairy is fourth generation, and it’s owned and operated by the Knaus family. The company creates quality, artisan cheeses with the finest ingredients. Their muenster cheese is young and mild in flavor, and the whole milk mozzarella has a rich taste. Both cheeses boast excellent melting properties.